"Get All The Support And Guidance You Need To Be A Success At Childhood Nutrition!" This Book Is One Of The Most Valuable Resources In The World When It Comes To What All Parents Should Know! Is the fact that you would like to have a healthier child but just don't know how making your life difficult... maybe even miserable? First, you are NOT alone! It may seem like it sometimes, but not knowing how to get started with childhood nutrition is far more common than you’d think. Getting your child or a child that you are looking after to eat healthy can seem like a somewhat impossible task. Kids can be very picky at times and for the most part, vegetables and other healthy foods are not high on their list of preferences. The good news is that it is possible to get your child to eat healthy nutritious food and you can even get them to like it. A lot of the process of getting your child to eat healthy is a trial and error process. You are going to have to keep trying new things and preparing them different ways until you become familiar with what healthy things your child does and does not like. So today -- in the next FEW MINUTES, in fact -- we’re going to help you GET ON TRACK, and learn how you can quickly and easily get your childs nutrition under control... for GOOD! "This Book Below Will Show You Exactly What What You Need To Do To Finally Be A Success With A Healthy Child!" As a person just like you who has struggled with getting a grip on nutrition, I have searched high and low to find the best strategies to fix this problem and I am fully qualified and equipped to help you put an end to your frustration with trying to wade through all the info you need to know to feed yur kid the right foods! There are a lot of tips and tricks you can use to get your child to eat healthy, many parents just are not aware of them. You should use as many of these tricks as you can because proper childhood nutrition is extremely important for the development of a child. Children who are malnourished in their earlier years will have noticeable health problems in the future and may suffer from certain deficiencies such as anemia. I am sure you do not want your child to have to go through something like this so get them eating healthy! 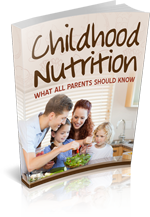 This powerful tool will provide you with everything you need to know to be a success and achieve your goal of getting your childs nutrition to a successful place. With this product, and it’s great information on healthy eating it will walk you, step by step, through the exact process we developed to help people get all the info they need to be a success. Don't let anything stand in the way between you and your success with your life and getting your nutrition knowledge under control. Think about how much you could change your life if you really applied the strategies in this book. You could be a success in your nutrition in a short period of time.